Available in several sizes. Order Hot Foot InvisiNet Knotless exclusion netting and installation hardware here. Hot Foot's InvisiNet exclusion netting is effective against all medium-sized and bigger roosting birds - the most persistent and destructive birds. The thin netting comes your choice of black, stone to blend in better with your structure for a sleeker look. Take a hammer drill and drill a 13/32" hole (oversize 3/8") to a depth of 1.75". Clean out debris. Insert eyebolt (part No. EB) fully into this hole, tapping gently with a hammer if necessary and then seal using silicone to prevent water ingress. Turn the head of the eyebolt in a clockwise direction to tighten firmly. Take a tensioner (part No. TG M6 or M5) and attach the hook end to the eye of the eyebolt. Take a ferrule (part No. NF) and pass one end of the cable through ferrule, then continue this free end through the eye of the turnbuckle then back again into the ferrule and crimp firmly to make a permanent attachment. Run the cable from eyebolt to eyebolt and terminate using another ferrule. This will give you one piece of cable along one edge of the area which is to be netted. Cable should be tightened using the turnbuckle so it has about a 2" deviation when pulled with a 10-15lb. tension. Take a 1/4" drill and drill a hole to a depth of 1.25". Fit a Hot Foot Clip (Part No. CLIP) every 3 ft. along the cables if you are fitting 3/4" netting or every 5 ft. if you are fitting 2" netting or larger. To fit the clip, clean debris from the 1/4" hole you have drilled and insert the plastic anchor. Tap firmly into the hole using a hammer. Attach clip by inserting screw provided into this anchor using a Phillips head driver and seal with silicone. The cable should be slipped into this "Clip" to prevent it from bowing when the net is fitted under tension. Attach the net to the cable on all sides by using a stainless steel Hog Ring (Part HRS) which is applied using a pair of Hog Ring Stapling Pliers (Part No. HR7). Fit Hog Rings to every alternate square of the net. Clipset steel inserted in powder actuated tool ready for application. Clipset steel is firmly attached for end anchoring of turnbuckle. It is also used like the "clip" as an intermediate fitting. If Clipset Steel cannot be used, fit a Universal Clamp as end anchor and beam clip as intermediate fitting. Beam clamps are attached to steel beams by hammering onto the beam. Do not use beam clamps as Corner connections as they do not have holding strength and will "slide" as the tensioner is tightened. The Hot Foot "magnet" clamp can be used to attach small nets to air conditioners, net flaps inside I-Beams or used in conjunction with resin to bird-proof larger areas such as fire escapes. Follow exactly the same procedure as we describe for a masonry surface however as an end and intermediate anchor, use Hot Foot Clips with sheet metal screws (Cat No. SMSC). These are packed 100 per bag and comprise the clips and sheet metal screws. If the surface will not accept the Clip, then you need to try the Hot Foot Clip with Stucco anchor (Cat. No. SA). Great care has to be taken in the installation of this anchor otherwise it will pull out and allow water penetration. Place the white plastic stucco anchor onto the end of a Phillips head screwdriver and place the sharp tip of this anchor against the Stucco. Bump the end of the screwdriver handle so the sharp point penetrates the stucco up to the beginning of the screw thread. Then, screw the anchor into the stucco until the head is flush with the surface. DO NOT OVER TIGHTEN. Cover this anchor with adhesive or a suitable silicone to prevent water ingress. Place the screw provided with the Hot Foot SA through the small eye of the Clip and then insert into the plastic anchor using a screwdriver. DO NOT OVER TIGHTEN because if so, you will destroy the integrity of the thread made when you inserted the plastic anchor initially. Go ahead and attach netting in the usual way. 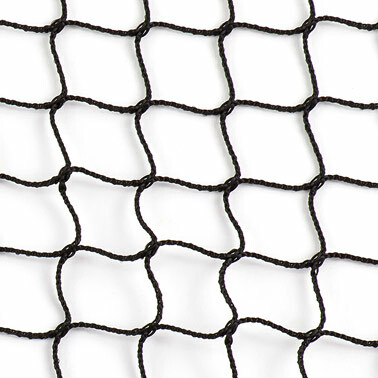 Knotless netting is better than knotted due to its lighter weight. For GFRC or when under instructions not to penetrate the surface, Hot Foot provides a bracket called a Universal Bracket Large (Cat No. UBL) which can be attached to the surface every 2 ft. using an adhesive. We recommend Fastbond adhesive. UBL as end anchor. UBL as intermediate anchor. Clean the surface to remove all debris and flaking paint etc. Apply Fastbond adhesive to the back of the universal bracket large and press firmly onto the surface so the adhesive squeezes through the 6 holes. We strongly recommend either Fastbond or Gator Grip™ adhesives or a combination of both. Leave to dry until adhesive achieves full strength. Then run turnbuckles and cable in the usual way. DO NOT exert too much tension on turnbuckles when tightening as it is NOT NECESSARY to use as much tension on GFRC as you do for masonry or steel. Order Hot Foot InvisiNet installation hardware here.